New on Blu-ray and DVD July 17, 2018 "Rampage" and "I Feel Pretty"
A woman struggling with self-esteem issues finds herself irresistible after falling and hitting her head during an exercise class. Her newly found confidence allows her to carry herself in a new way that allows her to live a more fulfilling life. “I Feel Pretty” is a light hearted comedy focusing on the idea that beauty is only skin deep and that how perceive ourselves on the inside will translate to the outside. Amy Schumer, who also produced the film, is the reason “I Feel Pretty” works. Schumer has just the right amount of comic timing and energy to pull of the role of the ugly duckling who is now (in her head) a swan. And even though the comedy is uneven and has some pacing problems, the film entertains and even delivers some unexpected tenderness. All in all, “I Feel Pretty” is an enjoyable comedy about perception and coming to terms with the reflection in the mirror. “Rampage,” which is loosely based on the 1997 video game, is a throwback to the 1950's monster films, where man through science brings about devastation by trying to control nature. Then it was radiation. In today's world it's gene splicing. Primatologist Davis Okoye shares an unshakable bond with George, the extraordinarily intelligent gorilla who has been in his care since birth. When George along with a crocodile and a wolf are accidentally exposed to a gene-altering serum, they begin to mutate and take on violent tendencies. It's up to Dwayne Johnson, once again playing the reluctant hero, to stop the world from ending, all the while saving his primate friend's life. 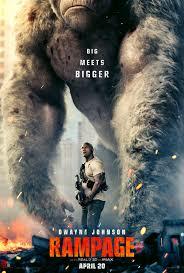 “Rampage” is a silly and fun popcorn movie. As a fan of Godzilla, King Kong and other golden age monster flicks, I liked the familiarity the film brought to the screen.